Welcome to another Tea Tuesday. This week my vignette features the colors of pink and green. You'll find another one of my Vintage wicker chairs, painted a Pistachio Green, also, another one of my mothers vintage picnic baskets, also painted in Pistachio green. I really fell in love with this color after seeing some lovely vintage wicker painted this green over on Carolyn's lovely blog, Aiken House & Gardens, where she did a post on July 30th entitled "Going Green", so I went out and purchased a couple cans of this spray paint, and tah dah!! I LOVE it!! Also included in this week's vignette, is a lovely tea/coffee pot by Lefton, a soft green slice of faux cake of Rhonda's, a sweet basket with faux white and pink toned roses, a couple of pretty pillows done in pinks and greens, and a cute table with a metal base of roses that I just got today from Goodwill (all painted up white now! ), and of course, this week's featured teacup. Here is a close-up of the items on the table. And here is this week's featured teacup.....This cup is by Royal Ascott, and has a sweet bouquet of pink roses and other cottage flowers on white. This is the mark that is on the bottom of both the cup and the saucer. The saucer too has the same pretty bouquet as the cup, plus another little grouping of pretty flowers. This is the chair, which is the same as the pink chair I showed you in a previous post, but this one has the arms on it, whereas the pink one does not. 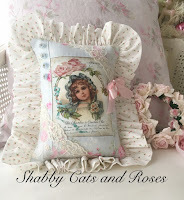 The rose embroidered pillow is by Rebecca Nelson, and the lady Image pillow is one of mine that is currently listed now on Ebay. Here is the picnic basket...this one has some flaws with it, but I use it just for display, not for actual use. Those are the same faux roses used in my Pink Saturday post, and that's a vintage embroidered pillowslip draped over the edge. Here's a close-up of the table I purchased at Goodwill. What a score this was to find!! Love those roses!! We think alike. After viewing Carolyn's post with the pistachio green it got me thinking I could paint some things with that colour too. I haven't looked earnestly yet but haven't found that colour in a spray paint - what brand did you use? It looks fabulous on wicker and your things turned out really nice. I love green! Super!!!!!! Love the table...great find! What a joy to read your beautiful post. Your vignettes are really pretty and I love looking at them. Your tea cup and saucer is so pretty. I love this style! Simple and vintage. I absolutely love the colour pistachio green! I think next to painting things white, I love the green. Love the basket and the chair! Your teacup is lovely as is the teapot. The faux cake is gorgeous too! Your linens and laces are beautiful as well! A pretty tea post and a feast for the eyes! Would love to sit and have tea with you at that sweet little table! Thanks for sharing and have a lovely week. Lovely colors together...the green looks refreshing like mint! Your chair looks fabulous and I love your tea sets always! Beautiful, beautiful, beautiful!!! (As always!!) You have such an amazing knack for putting together a beautiful vignette and then photographing it so beautifully. I LOVE that teacup. It's exquisite. And I love that shade of green. I think I've told you before that pink, green, and white is my favorite color combination, so I'm totally in love with everything. that green is just GORGEOUS!!!! Just lovely! The chair, the picnic basket, the pillows! I do love the Teapot and teacup! This is one lovely vignette! Just absolutely adore it it all, down to the cake! Thank You for joining me for Tea Time Tuesday! I do wish I had the pillowcase! What a lovely dress it would make for my granddaughters! Gasp! I KNEW that was my pillow! That is from a LONG LONG LONG TIME AGO! Maybe five years at LEAST! Your creativity is inspiring and I am planning on doing some creative painting around here soon. I like your teacup and it goes so well with the tea pot and well, your whole home! What a lovely setting. The green is so pretty, so refreshing. I am going to come for a visit so we can go to the thrift stores together. Everything you touch turns into magic. Such a beautiful post. Your pink and green displays are lovely. I really like the painted wicker and the pretty Royal Ascot teacup. Lovely, lovely pinks and greens. And whites. Pink and green are lovely colors together! Pink and green is such a lovely combination. 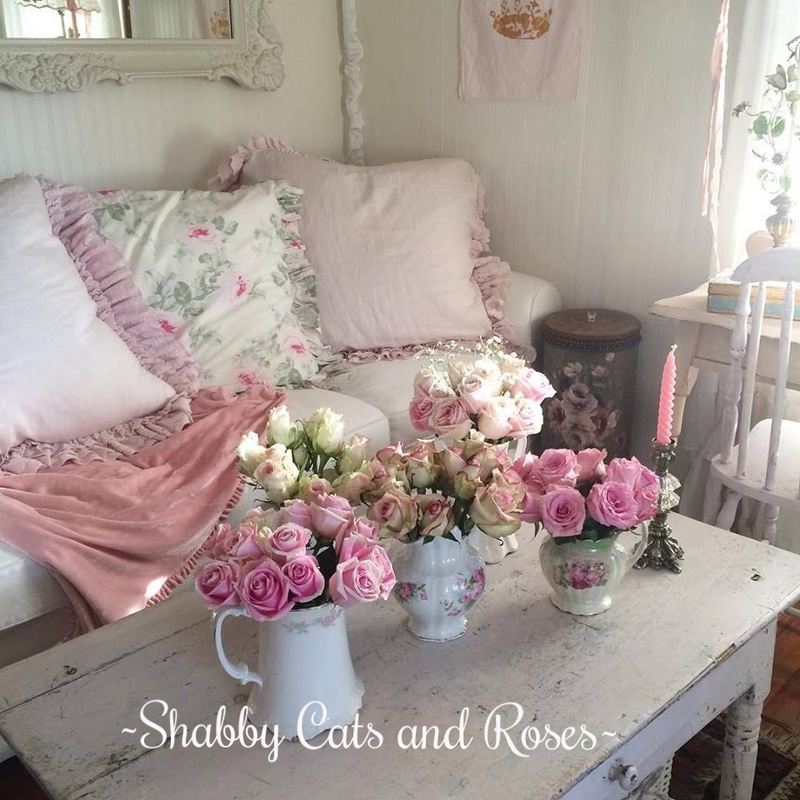 I love your tea cup collection and really luv your green chair and pretty pillows! What lovely photos! You always do such a good job. oh I do love your green wickers! I have one too painted in green. Aren't they look so cottagey.. welp, yours do! love your post today. your teasets are just stunning! my fave! Oh, I do love the green wicker chair! And the cushions! And the cup and saucer! And the picnic basket!!! Your posting today is loverly!!! On Terri's blog you mentioned that you were waiting for a teacup from Canada. Is it coming from a woman named Wendy? Kathy sent me over! 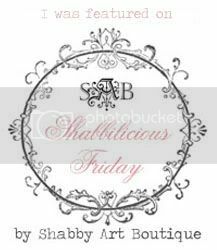 Love your blog and your photos are great! The green with the pinks is so pretty. My friend Wendy sells on Ebay. She has some lovely teacups and china listed. Her ID is...bobwen3... I buy from her all the time!! Drop by my blog sometime. I came over via Debbies blog and I am your newest follower. This is just lovely, I am so glad I found you! I think I like this selection of green items grouped together as much as I do the previous one with the pinks!! Isn't this green the prettiest color and so popular today!! I love the way you painted the older picnic baskets...gives me an idea of what to do with a couple I have in my attic! Your tea cups/saucers collection is lovely, too. You are so talented, my friend! Have a fun weekend...stay cool! Thanks so much for stopping by and entering my giveaway! And also for adding my badge to your sidebar! What a lovely post! You have the most amazing eye and vinette arrangments! I enjoy coming to your blog and visiting with you! Best Wishing on my giveaway! I'd say that table was a score! I am loving that green. Can I ask what brand of paint it is? I may have to jump on that green bandwagon! Have a great weekend Brenda! I have your Tea featured on my weekly Feature this week. I'm visiting from Lady Katherine's where she has so sweetly featured your beautiful tea! Ohhh my goodness! I'm not sure where to start, my friend! As soon as I seen this first photo over at Katherine's...I just knew that I had to come and see more!!! I just adore your pistachio green wicker chair and vintage picnic basket! I do love that color!!! Mixed with the pretty pinks...well it's perfect!!! Sooo sweet and sooo cottagey!!! 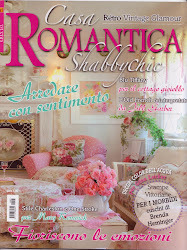 I have a bedroom in my house that I have decorated in green and pink as well...I call it my Tea Rose bedroom. So as you can see, I really do love this color combination!!! I am in awe of all your pretty linens and embroidered pillows...they're gorgeous, my friend! And...the new little table that you found at GW is sooo perfect with this beautiful grouping! It's all sooo very pretty...right down to that gorgeous teapot and teacup! Thank you so much for sharing your pretties with us...this was such a treat!!! This is the first time that I have visited your delightful blog! Just wanted to let you know that I am adding you to my list of blog follows! I'm looking forward to your upcoming posts...and going back through your past posts! It's so very nice to meet you, Brenda!!! Visiting for the first time. Love your pistachio green paint color. What is the brand? Please visit me and follow me back. Neighbor left "free to a good home" couple of vintage metal chairs. I've sanded, primed, and now am deciding on paint color. I'm going with the lovely green you used. I will whip up some simple pillows for the chairs with inexpensive fabric- not like your lovely barkcloth (we have a humidity issue in central Virginia so the pillows will be ruined by end of summer). But I will aim for the same look as your scene. Thanks for the inspiration.